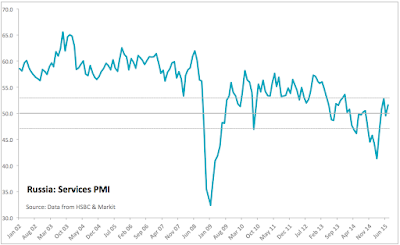 Having covered Russian Manufacturing PMI for July here: http://trueeconomics.blogspot.ie/2015/08/3815-russia-manufacturing-pmi-july-2015.html, let's take a look at the today's Markit release of Services and Composite PMIs. Services PMI rose to 51.6 in July compared to 49.5 in June, with new business activity reaching fastest growth in 20 months. On a 3mo average basis, sector performance through July was at 51.3 - showing a marginal rate of recovery, and a major improvement on 3mo average through April 2015 (at 46.0), as well as on 3mo average through July 2014 (48.5). 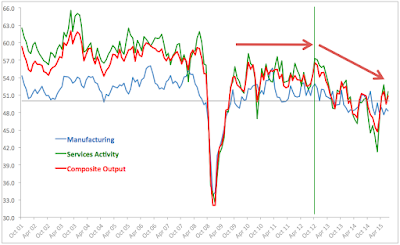 As chart above shows, Russian Services PMI posted above 50 readings in three out of last four months. However, by historical standards, this expansion is extremely weak. Per Markit: "The Russian service sector returned to modest growth during July, with activity rising on the back of the strongest gain in new business for over a year-and-a-half. Still, excess capacity remained a problem, with companies again comfortably able to make inroads into their work outstanding despite cutting jobs for a seventeenth month in succession." 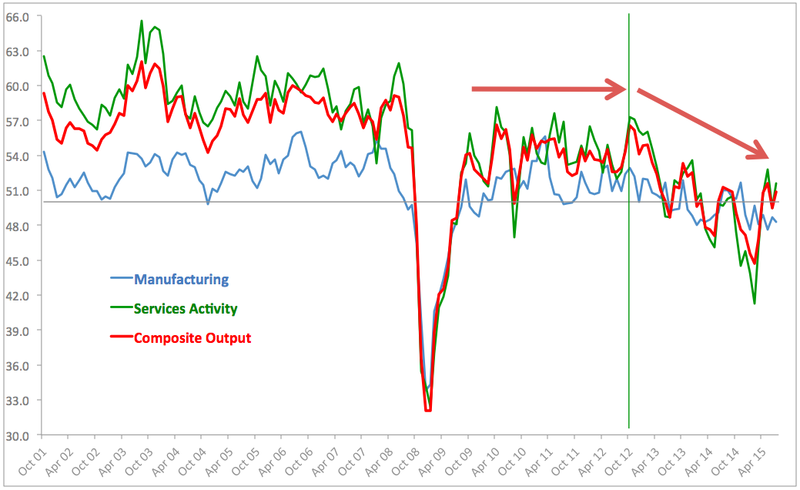 The decline in Manufacturing (see link above) meant that the Composite PMI for Russia was weaker than the Services PMI. Nonetheless, Composite PMI reached 50.9 in July, up on 49.5 in June. 3mo average through July is at 50.7 against 3mo average through April at 47.4 and 3mo average through July 2014 at 49.5. Just as with Services PMI, Composite PMI has now posted above 50 readings in three out of four last months. The above suggests strengthening in the stabilisation and early recovery momentum in the Russian economy, albeit we need a rebound in Manufacturing to above 50.0 reading for a couple of months to confirm robustness of this development. While it does appear the Russian economy is now past the worst period of contraction, calling any recovery will require at least couple of more months of improvements in PMIs.